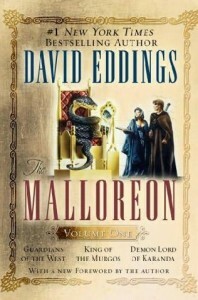 Eddings' second series was another five book fantasy series, this time a sequel to the Belgariad. The Western kingdoms have been at peace for several years since Torak's defeat, with King Garion of Riva happily married and doing a fairly good job of ruling the small island kingdom of Riva. However, things start to go wrong as a fundamentalist cult starts to gain followers in the neighbouring Kingdoms and the sorcerer Belgarath starts to get hints that the contending 'Prophecies', whose conflict is mirrored among the conflicts of the world's Gods and mortals, aren't finished their millennia-spanning game quite yet. When Garion's baby son Geran is kidnapped by a mysterious former priestess of Torak named Zandramas, Garion is forced to go in pursuit – however he is hampered by the thread that if he uses too much of the Orb of Aldur's power to assist him in the chase Zandramas may kill his son rather than let Garion reclaim Geran. Again Garion has to assemble a group of companions, some familiar and some new, and set off in pursuit of Zandramas – a pursuit which inevitably involves a multitude of adventure and much travelling to any location they managed to miss out in the previous series. Again, Eddings cunningly rigs his world so that the similarity to the previous series and the contrived nature of some of the journeying is explained by the plot device of two contending 'Prophecies' playing games with the universe. Eventually it all comes down to a Choice, which inconveniently has to be made by a neutral party – although it is never really in much doubt which choice will be made, since Garion and his companions seem to win every single confrontation. The ending is a bit more complex than the fight that ended the previous series and there are some interesting subplots, meaning that this second series probably has a better plot overall than the original “Belgariad”. The characterisation is fairly similar, although one of the new characters, the Emperor of Mallorea, ‘Zakath, is one of the more intriguing characters in the story, and actually has a small amount of moral ambiguity which is a rarity in the series. A couple of the subplots are a bit darker than anything in the Belgariad, showing the effects of a deadly plague sweeping Mallorea as well as the effects of demonic possession. Eddings' writing style doesn't change much, so all the comments that applied to the Belgariad also apply here, with more entertaining characters and good dialogue. There are also plenty of Epic Fantasy clichés again, and although the plot isn’t quite as predictable as in The Belgariad it is similar enough that it could attract some accusations that it is just a retread of the first series. In summary, again a light read that is unchallenging but entertaining, although again people looking for originality or depth may be advised to look elsewhere.